Familial chronic benign pemphigus is also known as Hailey–Hailey disease. 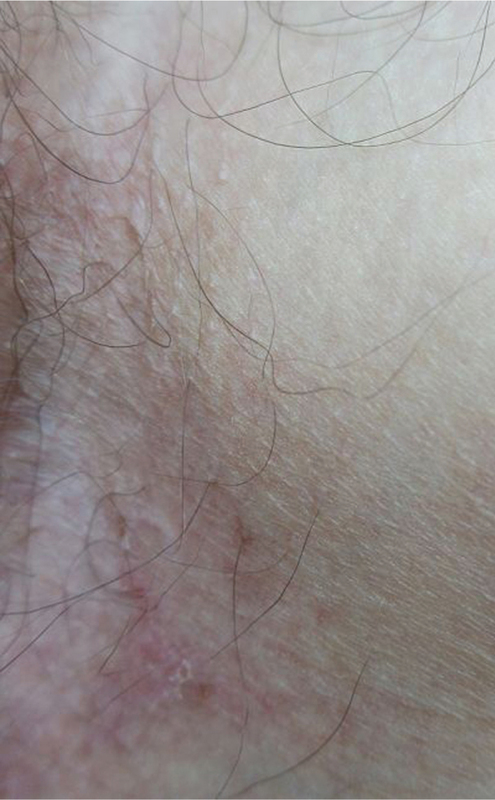 This rare chronic genetic skin disease leads to the formation of vesicles and erythematous plaques with overlying crusts in the axillary and inguinal regions . Treatment of the disease is usually done with antibiotics and topical or systemic corticosteroids, although both have limited results, it is highly unusual for cases to present so much resistance to the standard treatment, with the patient making use of over 20 treatment regimes in the past without success. Treatment with botulinum toxin type A is proposed due to its action in reducing sweat production ,,. A 60 years old Caucasian woman with a diagnosis of Hailey–Hailey disease for 20 years, presenting with recurrent lesions in the inguinal region characterized by erythematous plaques with flaccid bullae and erosion, maceration, and intense fetid odor ([Figure 1]). The patient had limited response to a large number of classic treatments already administered, including different associations of both corticosteroids, topical or systemic, and antibiotics, such as prednisone, erythromycin, clindamycin, sulfonamide, tetracycline, imidazole, and lymecycline. The differential diagnosis of the condition is made with pemphigus vulgaris, Darier’s disease, simple intertrigo, and dermatophytosis. The diagnosis of Hailey–Hailey disease was established by clinical examination and histopathological findings. Given the years of treatment without satisfactory response, many a times associated with intolerance to conventional treatment regimes, the patient was submitted to applications of 50 units (U) of botulinum toxin type A, on points with distance of about one centimeter between one another, 2 U being injected in each point. All other treatments were suspended following the application, and, after 20 days, the patient returned with significant improvement and has not shown recurrence after 60 days of application ([Figure 2]). Figure 1 Lesions before the application of botulinum toxin type A. 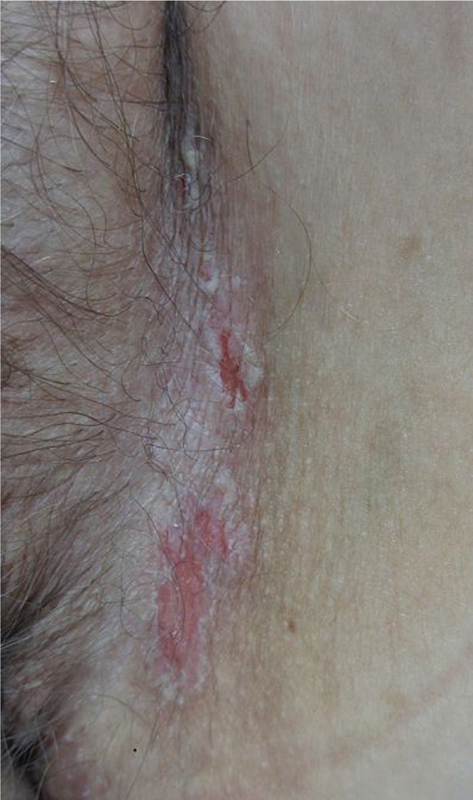 Figure 2 Lesions after 20 days of application of botulinum toxin type A.
Hailey–Hailey disease is benign, but often undermines the physical and emotional well-being of patients. Pain, itching, unpleasant odor, and even the appearance of the lesions compromise the quality of life. For this reason treatment even for cases with few lesions is recommended . The disease usually starts between the second and third decades of life, evolves in spurts, has variable manifestations, and the lesions heal without the formation of scar tissue . There is a mutation in the gene located on chromosome ATP2C1 3q21q24, leading to loss of cell adhesion in epidermis . Epidermal defect leads to acantholysis, either spontaneously or as a result of friction, heat, sweat, or infections. It manifests itself with papules, vesicles, and bullae that break down quickly, leaving erosions and crusts with or without itching or burning, often the lesions present infected by bacteria, yeasts, and viruses, manifesting usually by fetid odor, pain, and oozing. The infected tissue plays an important role in the exacerbation and persistence of the disease. The most affected regions of these lesions are the intertriginous areas, such as the axillary folds, the inguinal and perineal region, and the sides of the neck, mucosal involvement is rare . Histologically, the epidermis shows intraepidermal suprabasal acantholysis and pronounced dyskeratosis of keratinocytes with grains and round bodies. In more chronic lesions epidermal hyperplasia, parakeratosis, and focal crusts can be observed. Direct immunofluorescence of the lesions is negative. Treatment is symptomatic with general measures to prevent friction and sweat, and treatment of secondary colonization. The following drugs have been suggested: oral tetracycline, imidazole, sulfone, thalidomide, prednisone, methotrexate and topical cyclosporine, and tacrolimus and topical corticosteroids, which are the most used . Surgical treatment with wide excision, dermabrasion, Erbium (YAG) or CO2 lasers, and photodynamic therapy have also been suggested as possible treatments with varying degrees of success . Botulinum toxin type A is a protein that produces chemical denervation, by blocking release of acetylcholine from nerve endings. The proposed use of botulinum toxin, is due to its action blocking cholinergic stimulation by the post ganglionic sympathetic fibers, decreasing sweat production by the sweat glands ,,. Heat and sweat are exacerbating factors of patients with Hailey–Hailey disease and less sweating, with a reduction of local humidity, works to reduce local irritation factors important in the formation of the lesions and reduces colonization by microorganisms involved in exacerbations. The use of botulinum toxin type A can be considered as a safe therapeutic option with simple application for patients with limited response or intolerance to conventional treatments. Hohl D, Mauro T. Darier disease and Hailey-Hailey disease. In: Bolognia JL, Jorizzo JL, Rapini RP, editors. Dermatology 2nd ed. New Haven: Mosby 2008. p. 791–800. Gisondi P, Sampogna F, Annessi G, Girolomoni G, Abeni D. Severe impairment of quality of life in Hailey-Hailey disease. Acta Derm Venereol 2005; 85:132–135. Bessa GR, Manzoni AN, Bonamigo RR, Grazziotin TC, Weber MB. Tratamento da doença de Heiley-Heiley com toxina botulínica tipo A. Na Bras Dermatol 2010; 84:717–22.16. Kang NG, Yoon TJ, Kim TH. Botulinum toxin type A as an effective adjuvant therapy for Hailey-Hailey disease. Dermatol Surg 2002; 28:543. Azulay RD, Azulay DR. Genodermatoses e disembriopatias cutâneas. In Azulay Rd, Azulay-Abulafia L (org). Dermatologia, 5th ed. Rio de Janeiro: Guanabara Koogan; 2008; 621–655. Lapiere JC, Hirsh A, Gordon KB, Cook B, Montalvo A. Botulinum toxin type A for the treatment of axillary Hailey-Hailey disease. Dermatol Surg 2000; 26:371–374. Sampaio SAP, Rivitti EA. Doenças bolhosas e disembriopatias cutâneas. In: Azulay Rd, Azulay-Abulafia L (org). Dermatologia, 5th ed. Rio de Janeiro: Guanabara Koogan; 2008; 1063–1074. Burge SM. Hailey-Hailey disease: the clinical features, response to treatment and prognosis. Br J Dermatol 1992; 126:275–282. Lowe NJ, Yamauchi PS, Lask GP, Patnaik R, Iyer S. Efficacy and safety of Botulinum toxin type A in the treatment of palmar hyperhidrosis: a double-blind, ran domized, placebo-controlled study. Dermatol Surg 2002; 28:822–827. Lowe PL, Cerdan-Sanz S, Lowe NJ. Botulinum toxin type A in the treatment of bilateral primary axillary hyperhidrosis: efficacy and duration with repeated treatments. Dermatol Surg 2003; 29:545–548.